2) ensure the best possible protection against dust, dirt, moisture and eventual damage. use quality packing materials, provide sufficient padding, pack the boxes full and seal them tightly. Have in mind though that every individual item has its own specifics you should take into account when preparing it for storage in addition to the general rules above. 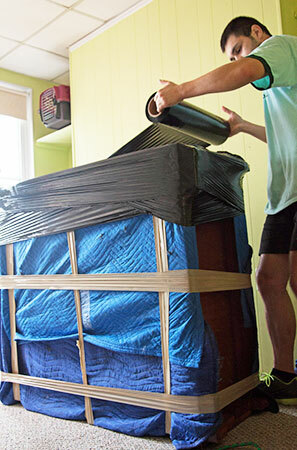 Your creativity may be put to the test when packing awkwardly shaped furniture pieces. Step 1. Empty your furniture (if applicable), vacuum with a brush to remove any excess dirt, and clean all the surfaces with a gentle solution of soap and water. Let the furniture air dry fully, preferably in sunlight. Step 2. Apply furniture protection spray, as well as leather conditioner, when applicable. Protect any wood finishes with a coat of wax to seal the wood and reduce the risk of mold development. Wipe down metal elements with oil to prevent tarnishing and rusting. Step 3. Disassemble large furniture pieces as much as possible. Protect small protruding elements with bubble wrap or rags. Pack all the detached pieces from one furniture item together and put small hardware parts (bolts, hinges, etc.) 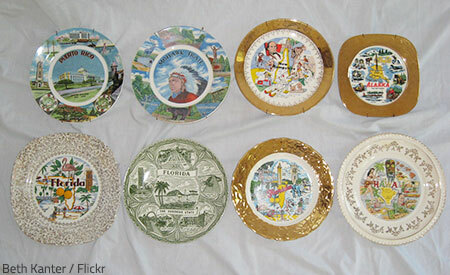 in sealable plastic bags (tape the bags to the corresponding furniture to prevent losing or mixing the small parts). Step 4. Cover the furniture with sheets and blankets or specialized fabric furniture covers (especially if your items will be stored long-term). Secure the blankets in place with rubber bands, cinch straps, or plastic wrap. Cover upholstered furniture with white cotton sheets, as dark colored fabrics can bleed color onto the stored items if the humidity level in the storage unit is too high. Step 1. Empty any appliances you intend to put into storage and clean them thoroughly (needless to say, freezers and refrigerators must be defrosted first). It’s a good idea to add bleach or baking soda in the cleaning solution to properly disinfect the appliances and remove any bad odors. Step 2. Make sure any water is completely drained from the attached hoses or internal mechanisms of your household appliances (dishwashers and washing machines, in particular). Otherwise, water can freeze and damage the appliance during the winter months or cause mildew during warmer weather. Step 3. Tie down and secure any attached cables and hoses. Store removed hoses or other attachments inside the appliance. Good to remember: It is recommendable to leave the doors of your household appliances slightly ajar when they are in storage to allow for proper ventilation (it will help prevent condensation and bad odors). Make sure all electronic equipment that will go into storage is completely clean and dust-free. Pack sensitive electronic devices in their original boxes or ones of similar size and quality. Fill any empty spaces in the box with crumpled packing paper, foam sheets, or anti-static packing peanuts to ensure optimal protection during storage. Seal the boxes tightly and make sure no moisture can come in contact with your stored electronics. 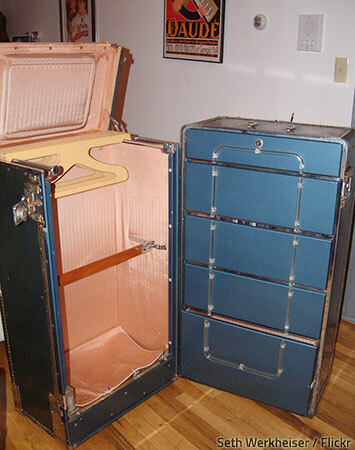 Are there safes, especially designed to hold clothes? When storing clothes for prolonged periods of time, you are strongly advised to refrain from folding them up and stuffing them in boxes. Hang your garments on a clothes rail instead to keep them wrinkle-free and ensure good ventilation (this will help prevent mold). It may be a good idea to wrap your most expensive and delicate clothes in a suitable protective cover to keep them fresh and clean all the time. Store your hanging clothes in wardrobe boxes as they provide the best possible protection against dust and dampness. It is recommendable to use some kind of insect repellent products (naphthalene or mothballs) to protect clothing that will be stored long term. Step 1. Make sure any books you want to put into storage are fully dry. It may be a good idea to keep them spread on a table in a room that gets plenty of sunlight for several days before packing them for storage. Consider running a dehumidifier in the room, as well. (If you find mold on any of your books, take them to a conservator first to have them properly cleaned and restored). Step 2. Wrap leather books in paper so that they don’t stick to each other. Step 3. Arrange your books in small sturdy boxes (books are very heavy, so larger boxes will be difficult to lift and stack and may even break under their own weight). You can place smaller books upright, but it is generally recommendable to pack books flat (especially larger ones) in order to prevent damage to the spines. On second thought, it may not be a good idea to put valuable breakables into storage. Store statuettes, figurines, and other pieces of art or fragile collectibles in wooden crates (if you decide to use cardboard boxes instead, at least make sure they are small and very strong). 4) Wrap lamp shades with packing paper and place them inside each other. It’s storage time for some of your old belongings. Do not store valuables (documents, jewelry, furs, very expensive items, irreplaceable items, etc. ), flammables substances (gas, diesel, oil, paint, etc. ), firearms, explosives, drugs, perishable items, or any other hazardous materials or items that produce odors in a self-storage unit. So, your belongings are already well prepared and safely packed for storage. The only thing left to do now is to organize your storage unit in the most efficient and practical way possible. 1) Cover the floor of your storage unit with canvas tarp or plastic sheeting to keep moisture away from your belongings. You may also want to use wooden pallets or shelves to keep your items above the ground. This will allow air to flow freely around the boxes and furniture and will help prevent mold growth and other related problems. 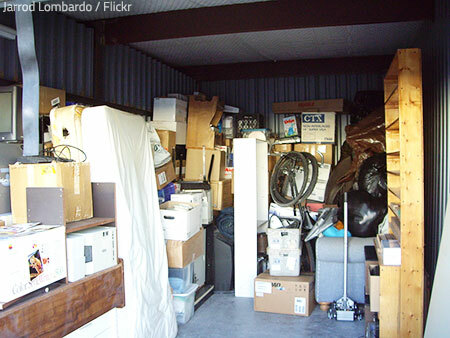 Can you spot the five serious mistakes in the way this storage unit was packed? 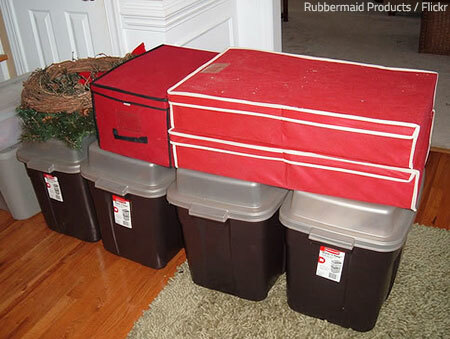 2) Leave some airspace between your stored items and the walls of the storage unit to ensure good ventilation. 3) Leave a passage through the middle of the stored items for easier access to your belongings. 4) Place your largest items closest to the walls. 5) Store large furniture pieces vertically to save some space. 6) Store your mattress flat (not on its ends or sides as they are not sturdy enough to withstand its considerable weight). Make sure you place only lightweight items on top of the mattress and distribute them evenly. 7) Stack chairs seat to seat (don’t forget to put some cloth or paper padding in between). 8) Store lightweight items on top of drawers, dressers, cupboards, and other sturdy pieces. Never stack boxes on top of a couch though, as it may sag or the upholstery may get badly damaged. 9) Place smaller items in uniform sized boxes. (You can keep small items like pictures, souvenirs, and various other keepsakes or collectibles in drawers, just make sure they are properly wrapped to avoid eventual damage). 10) Stack boxes of similar sizes one over the other (make sure you place the heaviest boxes on the bottom). 11) Make sure the labels of the boxes are facing the walkway. 12) Keep your LCD or plasma TV upright as the internal elements can get damaged if it’s placed flat or tilted. 13) Ensure the boxes containing fragile items are not stacked under heavier pieces. 14) Store artwork and mirrors upright (in their specialized boxes) and away from any heavy items. 15) Place the items you might need soon (or frequently) at the front of your storage unit.